Read about using JAWS screen reader software with BigKeys LX! 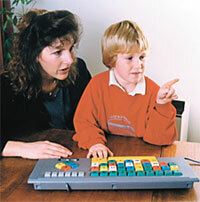 The BigKeys LX has an "ASSIST MODE" to accommodate those who cannot press two or more keys simultaneously. ASSIST MODE works with and enhances the Windows "Sticky Key" Accessibility Option. The BigKeys LX ASSIST MODE enables you to press the F key and have it remain active until you press another key. In ASSIST MODE, the F key becomes a "Sticky Key".